The stand I chose was a north facing, wide rectangle. That meant that for a very unreasonable R700 000 in 2004 rands, my future home would let me stare at the Zebra and Wildebeest from my bathtub, bed, living room and balcony. It would have been fantastic. I put down my 20% deposit and waited for about a year until development on the stands would start. Fast forward a year and I got a call from the developers. “Hey Patrick, your stand is ready for you to build on, though since we last spoke the council has forced some changes, could you come in to get updated?”. On arrival I was told that the council provided incorrect information on where the boundaries were, and so they were forced to adjust a few stands. Mine was unchanged, but there were four of the original 50 or so that had to be culled from the project and so the value of all properties had to be readjusted. This was good news apparently as they are now more exclusive, and I’d one day be able to sell for far more money. Luckily I have a built in calculator in the pre-frontal section of my skull, so I quickly knew they were going to add 8% or R56k to my bill. I could deal with that, but what I couldn’t deal with was how they rounded up from R756k to R1.2 million. What had actually happened was nothing to do with the loss of four stands. It was actually something known as a bait and switch scam. They would get people committed to a good deal in the beginning, only to tell them that it wasn’t available after all, and to offer them a total ripoff of a deal instead. In this case they had the added bonus of being able to use our deposits to earn themselves interest and develop the land. 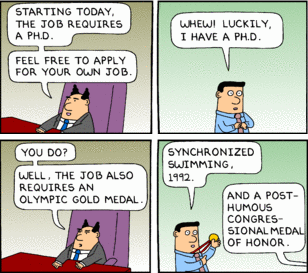 This is something that is actually fairly common in sales. Just 2 weeks ago for instance my wife and I saw a holiday to Thailand for a week for just R6500 each between September and November. We thought this would be a great way to spend less on our annual overseas holiday. When we called this particular saleslady scammer she took the dates and came back telling us that she could get us a great deal for just R12 100 each. Of course I wondered why the price had nearly doubled given that our dates were in the period listed, and we hadn’t asked for any optional extras. The answer was apparently that the ad only applied for specific dates in that period, and unfortunately those dates were all fully booked now. To our “thank you and goodbye” statement she said to just hold on a second while she spoke to her manager. Right… Of course there was a chance of a taxi driver attempting to rip us off, but in this case the hotel didn’t want any competition to their off ripping. My wife was recently in Thailand, and took a cab from the airport to a similar area of town and paid the costly sum of around R60, so we could do both trips for R1880 less than the hotel’s offer. I never checked, but maybe they were offering helicopter transfers. Do yourself a favor, when someone tries to pull a bait and switch on you don’t be outraged. Instead, you need to use the weapon that capitalism gives you: the ability to stop doing business with them and go to a competitor instead. Companies are banking on you not leaving, otherwise they wouldn’t try to push for higher fees at the potential cost of losing your business entirely. Walk away, there’s almost certainly going to be a better deal somewhere else. Stealthy wrote this blog post showing if you started investing in your TFSA at age 21, and stopped investing at 36 and never invested a cent again anywhere, you could still retire with R5 million (inflation adjusted). You can use them as part of a strategy to retire by 40 and live on R178 500 a year as I discussed in this post. Pay for your kids retirement with just R33000 leaving them with over R6 million at age 65 as seen in these calculations. Put away that R33000 before you have a kid and you can guarantee them a comfortable retirement! Put away money to pay for your kids education, I’m doing this. And the best reason of all: Screw the future taxman by having a huge investment account SARS will never get a cent from! I’ve had one since they first opened, with Easy Equities, because at 0.25% transaction fees and no annual fees they were the cheapest one in the country that would give me access to ETFs. A year later they lost that title though. ABSA offered a TFSA at just 0.2% transaction fees, also with no annual fees. Now for most people the potential saving of R250 over a 17 year period isn’t enough to make them go through the admin of opening a new account. I’m not most people, I want things to be optimal, so I went through the process of filling in the details on line, getting hold of all the FICA forms I needed, having the account created, adding the new account to my internet banking, making a payment, checking if the payment arrived and then buying ETFs. This took many very boring hours to complete, at one point it nearly drove me to chew off my left foot. That R250 was surely earned at below the proposed minimum wage, but I persevered and now had bragging rights of holding the cheapest TFSA in the country! Until last month that is. You see at the 0.2% transaction fee that meant ABSA would probably only make R1000 out of me over a 17 year period, and nothing more for the next 20 or so until I needed the money. Clearly this isn’t going to help them pay much of their costs, and being a listed business their goal is to make their shareholders happy by showing more profits. Now there are two ways for finance companies to make more profits. Either get more customers to give you some money, or get your current customers to give you more money than they already do. My new bank Capitec is a master of the former. They’re a cheap bank, but have had customers flocking to join them and in doing so they’ve made bucket loads of money for their shareholders. ABSA tends to follow the second option. When I opened my very first trading account in 2013 ABSA was also the cheapest provider. Their regular brokerage account had an R800 annual fee, but if you traded 5 times a year that fee would be dropped. I easily met this by trading once a month just after payday, so it wasn’t a problem for me. Unfortunately a while later they changed the rule. Now you’d have to pay a pro-rata fee until after your 5th trade. This meant I’d now have to pay R333 a year. Not too bad, but I wasn’t happy about it. Then it was changed again, now you’d have to pay R75 a month unless you traded 3 times a month. At R120 minimum to trade that wasn’t an option, so my initially free account would now cost me R900 a year. I decided to walk away. Now they’ve once again decided to shift the goalposts on the tax free accounts by adding an inactivity fee of R35 for every 60 days you don’t trade. At first I thought I could get around that by just trading one share every other month and spend ten cents in fees, but it seems they thought of that and implemented a R15 minimum fee. That means that for most people who invest monthly, the fee isn’t actually 0.2%, but is in fact 0.55%. As that’s too high for me to accept I’ve decided to move my TFSA to Easy Equities. Unfortunately there’s a fee of R200 per ETF to do that, luckily for me I only have one. 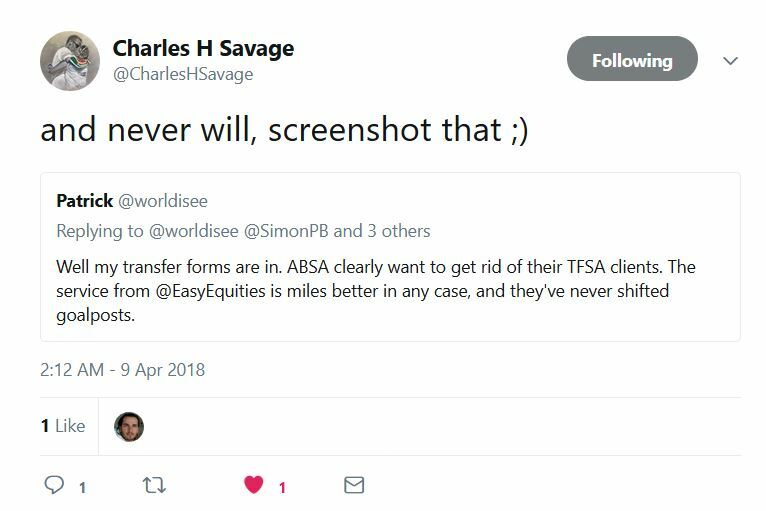 Even so, ABSA is getting the equivalent of three and a half years worth of fees out of me in one quick action, and many people have much more than one ETF. Come to think of it, it’s a really brilliant way for them to raise cash. They should let Elon Musk know he doesn’t need to keep selling those flame throwers. Instead all he has to do is start charging a $10 fee for using the previously free supercharge stations, and then update their vehicles to disable the ability for people to charge their cars at home. *Again just to be totally clear to the very smart lawyers ABSA undoubtedly has on their staff, these two topics are completely separate, through pure co-incidence my wife calling the travel agent and ABSA implementing the new fee structure both occurred last month. **If you’d like to know how to open, fund and use a TFSA with Easy Equities you’re in luck. I did a full walkthrough of the process a while back. You can find it here. Is a R35 fee every 60 days enough to make you change TFSA providers?